BETTER as a distributor of mud pump fluid end expendable, specializes in supply all kinds of mud pump fluid end parts with reliable quality and best price, eg. 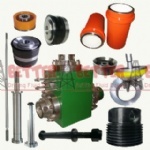 Bimetallic liners, Zirconia ceramic liners, Bonded urethane piston, Replacement rubber pistons, Full open valve & seats, G2 type, Double-angle o-ring valve, 4-Web valve&seats, Piston rod, Sub rod, Pony rod(Extension rod), Clamps, Fluid end cylinder and accessories, Threaded ring, Liner clamp, Cylinder Head Plug ,Valve Lock Cap, Valve Cover ,Liner Lock, Liner Cages ,Discharge Connector ,Discharge Adapter, Wedge Assembly, Upper Valve Guide, Lower Valve Guide, Seat pulller and puller head, pulsation dampener bladder, etc. All these parts provided are 100% interchangeable with those OEMs brands, including BREWSTER, BOMCO, DRILLMEC, ELLIS WILLIAMS, EMSCO, GAPCO, GARDNER DENVER, GASO, IDECO , NATIONAL , OILWELL , OPI , SKYTOP BREWSTER , WHEATLY , WILSON , WIRTH,etc.